When you talk about high altitude passes, the name Ladakh immediately comes to mind and quite rightly so. It is in fact commonly referred to as ‘the land of high altitude passes” and is the most desired destination for anyone looking forward to an adventurous ride. But is it only Ladakh that the passes are limited to? Do you have to travel all the way to Ladakh if you want to ride over a mountain pass? The answer is a definite no. There are several other passes in the states of Himachal Pradesh and Uttarakhand that are equally scenic, adventurous and also motorable. One such pass that is not known to many but is easily accessible is Jalori Pass; also known as Jalori Jot. For a brief introduction, Jalori is a mountain pass located in the Kullu District of Himachal Pradesh. At a distance of about 520 kilometers (depending on which route you take to get there), it is one of the closest high altitude passes to Delhi. It is located at a height of 3,120 meters (10,236 ft) and the road to the top is both scenic and challenging. It gets closed sometime in December due to heavy snowfall and then is declared open in March. Jalori Jot is in fact among the first passes to open each year. How can you plan a trip here and what are some of the things you must keep in mind is what we will be talking about in this article. There are several reasons why you would want to pick Jalori as the destination for your next trip. If you are already Googling mountain passes and reading about Jalori than I am assuming you want this to be an adventurous trip. That will become your reason # 1. The road across Jalori is a joy ride all the way. It is bad, broken, and narrow; and it is steep. You may even have to keep your vehicle engaged in first gear all the way to the top. And adventure is not limited to just driving across the pass. The nearby areas too are known destinations for camping and trekking. The second reason would be of going on a road that not many people have traveled on. Jalori Pass doesn’t even have a Wiki page so you can guess how offbeat this destination really is. But at the same time, it is not too remote either. The entire region is very well connected to the rest of the world. You will have no problem finding a place to stay for the night and will get all the facilities that you may need as a tourist. The scenic beauty of the region, however, is the biggest reason why you should travel this way. The area around Jalori Pass is a natural paradise and a trip here will take you through some of the most beautiful places you would have ever been to; like Shoja, Serloskar Lake, Tirthan Valley, and the Great Himalayan National Park. The answer to this question really is in your own hands. The road to the pass is narrow, steep and winding but as long as you have decent enough driving experience, know how to handle a vehicle in the hills and drive sensibly, you are absolutely safe. The people in this area are simple villagers and very humble people. The crime rate here is next to none and you will have full mobile connectivity at all times. If you are planning on trekking then hire a good guide who knows the area well. So in short, a trip to Jalori Pass will be fun all the way; as long as you plan it well, drive sensibly, do not get in any unnecessary altercations with anyone and do not go wandering around in the forest on your own. Jalori Pass is located in Kullu District at a distance of about 520 kilometers from Delhi, 150 kilometers from Shimla, and 80 kilometers from Mandi. You can either take the road from Shimla via Narkanda and Anni; or travel from Mandi side via Banjar. More details on the topic are mentioned further in the article. When Does Jalori Pass Open? Jalori Pass gets closed for vehicles by mid to late December after it starts to snow in the region. In the months of January, the road across the pass remains buried several feet under snow making it impossible to cross. Winter starts to recede in March making the snow melt after which Jalori Pass becomes accessible in April; and remains so until early December next winter. There are two ways that you can reach Jalori Pass; one via Shimla; and the other one via Mandi. It actually makes it possible to complete the trip in the form of a circuit. You can start from Shimla and exit via Mandi; or vice versa. Both the routes are almost the same in terms of time and distance and are both equally scenic. You can either drive by your own car or motorcycle; or travel by public transport. The best and most convenient way would be to bring your own vehicle; but if that was not an option, then modes of public transport like Buses, Shared cabs, private taxis too are available on the route. For the sake of explaining the routes below, I will assume Delhi as your starting point. However, even if you were coming from a different city, going through the information below will at least give you a fair idea on how to reach Jalori Pass. The route from Shimla side is mostly preferred by motorcycle enthusiasts, or people who want to do the journey in the form of a circuit. You can start from Shimla, cross Jalori Pass, exit at Tirthan Valley and then return home via Mandi. Route of the Journey will be as mentioned below. Traveling this way, the total journey will be of about 500 kilometers, depending on where you started from in Delhi. This is necessarily a 2 days journey with a night halt at either Shimla or Narkanda. It cannot be completed in a single day unless you started from Delhi at about 2 in the night and drove non-stop for 18 to 20 hours. It will just make the journey too tiring and I will not recommend it. Best would be to take a break in between and then cross Jalori Pass on Day 2. Starting from Delhi, you will take NH1 and drive on the smooth road till Chandigarh. Just before entering Chandigarh, you will turn on the Himalayan Expressway and reach Shimla. There is some road widening work happening on this stretch so traffic may be a little slow. After Shimla, continue driving for another 2 hours and stay in Narkanda for the night. If you got late somewhere or wanted to, you can break the journey in Shimla as well. I personally prefer staying at Narkanda more rather than an overcrowded Shimla. Your drive on Day 2 will be of a total of about 7 hours so you will have some time for sightseeing as well. There are a few tourist places in Narkanda that are worth visiting but for you, Hatu Peak will pretty much be the only one. If you want to know about others, then you may read about them at Places to visit in and around Narkanda. Otherwise, get up early in the morning and take a drive to Hatu Peak. There is a motorable road all the way to the top so you can bring your car or motorcycle along. Going to Hatu Peak and coming back will take you about 90 minutes to 2 hours. After Hatu Peak, have breakfast in the town, check out of your hotel and start driving towards Kingal. Do not forget to tank up at the petrol station at Narkanda. From Kingal, you will then take the road towards Anni and then climb up the Jalori Pass. Once you cross Jalori, you will enter into the beautiful Tirthan Valley. There are several hotels here where you can stay for the night. Towns like Shoja, Jibhi, Banjar, and Gushaini are all well-known tourist places and good enough to stay. Seruvalsar Lake (also spelled Sirolsar Lake or Serol Sar Lake) is a high altitude lake in the Seraj Valley. The lake is located at an altitude of 3,100 meters (10,171 ft) and is accessible via Jalori pass. The trek for this lake starts right from the top of the pass and is usually a prime attraction of Jalori Pass or Tirthan Valley trip. To read more about this lake, please read Places to Visit in Tirthan Valley and Things to Do. If trekking to the lake was on your itinerary then you have two choices. There is a camp site next to the lake where you can stay for the night. So either you can drive up to the top of the pass, leave your vehicles there, trek to the lake and stay there for the night. Or you can cross Jalori Pass, reach Tirthan Valley, rest for the night and then trek to the lake on Day 2. Yes, this also means that you will have to climb up the pass from the other side once again the next day. If you were going to do that, then I recommend that you stay in Shoja itself. It is the first town that you reach once you descend from Jalori into Tirthan Valley. Now the route above explained how you can reach Jalori Pass from Shimla, arrive at Tirthan Valley and then return home via Mandi. But if you wanted to reach Jalori Pass via Mandi, then the journey will be exactly the other way around and route as mentioned below. Traveling in this manner, the total distance will be about 520 kilometers and this too will be a 2 days journey. The only difference is that your second day will be spent entirely in sightseeing in Tirthan Valley; and visiting Jalori Pass. This is, in fact, a great way to travel if you had Sirolsar Lake in your itinerary and you were short on time. Starting from Delhi, your first destination of the journey will be Chandigarh. Take NH1 and drive through Karnal and Ambala and then just before Chandigarh city, take the bypass that will have you exit on Chandigarh Manali highway. You will then start climbing up the hills and will arrive at Mandi traveling via Bilaspur and Sundernagar. After Mandi, continue driving another 38 kilometers towards Manali. Just before Aut Tunnel, there is a road that goes towards the small town of Larji that you will have to turn on. You must not enter the tunnel and take the exit towards your right. Stop for a minute and ask the locals if you weren’t able to locate it. Once you reach Tirthan Valley, you can stay at Gushaini, Banjar, Jibhi or Shoja. I will recommend that you break the journey in Banjar or Gushaini. Next day, make a day trip to the top of Jalori Pass; trek the lake and return to your hotel by evening. Reaching Jalori Pass by Bus will definitely not be an easy task but it is still doable. Depending on what your plan is, your first two destinations from your hometown will be either Shimla or Mandi. From both these towns, you will then have to find public transport for Jalori Pass. How you travel will heavily depend on what your itinerary is and for how many days. Let us take a look at both the routes. If you planned to reach Jalori Pass via Mandi then you would first have to board a Bus that can drop you at either Mandi, or near Aut Tunnel or in Aut town. All these places are on the highway to Manali; and there are regular buses from Delhi to Manali, both luxury and ordinary, that you will have to board to reach here. Once your Bus crosses Mandi, you have two choices. You can either get down before Aut Tunnel and look for a mode of transport; or you can go all the way to Aut town and look for a bus there. I will recommend the second option because buses on this route are mostly crowded. If you were waiting near the Aut tunnel, you may not get a seat and will have to travel standing all the way to Tirthan valley. So instead of getting down at the junction near the tunnel, continue to Aut town and get off the bus there. Once you have arrived at Mandi, or Aut Tunnel or Aut town, your next destination will be Banjar. There are regular buses from both Mandi and Aut to Banjar and you will have no problem finding one. After you have reached Banjar, you can either stay there for the night; or find another bus from Banjar for a place of your liking; like Shoja, Gushaini or Jibhi. Assuming that you stayed at Banjar for the night, the next day you can plan a visit to Jalori Pass. There are daily buses Banjar to Shimla, Banjar to Anni; and from Jibhi to Jalori Top in the morning that you can use for this journey. You can catch the bus, get down at Jalori Top, spend some time sightseeing and return to your hotel by evening. The last bus from Jalori top to Banjar leaves at around 3 PM so manage your time accordingly. If you were traveling from Shimla side, then you would have to rely completely on the daily bus for Banjar. It starts from Shimla early in the morning to arrive at Banjar by evening. If you were coming from Delhi, you will first have to board a bus for Shimla from Delhi which is really the easy part. There are several buses from ISBT Delhi for Shimla, at both night and day. Stay for the night in Shimla and board the next morning bus for Banjar. If you did not find the Banjar Bus, you can also look for a Bus to Anni which is the small town just before you start climbing for Jalori. From Anni, you can then board a shared cab and cross Jalori Pass. There are shared taxis available on the entire route that I explained for the Buses. You can easily get a shared cab between Mandi, Aut, Banjar, and Gushaini. From Shimla side as well, you can get shared cabs for Narkanda, Anni, Shoja, Jibhi, and Banjar. Fare of these cabs will be around the same as that of the Bus. The only difference is that from Shimla side, you will not get a shared cab directly for Banjar and will have to break your journey in multiple parts. These shared cabs mostly are a Sumo, Xylo or a Bolero. You can get a private taxi from Banjar and it will cost you around Rs. 1500 to Rs. 2000 for a round trip to Jalori Top. If you hired a cab from Manali, be ready to pay anywhere between Rs. 7000 to Rs. 8000. From Chandigarh as well, a private cab will cost about the same amount of money. If you hired a cab from Shimla, it may cost you well above Rs. 10,000 for a 2 days journey. Chandigarh is the nearest railway station to Jalori Pass and is located at a distance of about 277 kilometers. It is a major railroad and is well connected to the rest of the country. No matter where you were coming from, you will have no problem finding a train to Chandigarh. Once you have reached Chandigarh by train, you can either book a private taxi for Tirthan Valley or complete the journey by public transport. A Private taxi from Chandigarh to Tirthan Valley will charge close to Rs. 5000 depending on the type of cab (hatchback, sedan or SUV) you chose. There are several daily buses between Chandigarh and Manali so you can travel by public transport as well if you wanted to. After boarding the bus, you will then get down at either Mandi, near the tunnel or at Aut; and then travel to Banjar in the same manner that I explained above. After reaching Tirthan Valley, you can then rent a private taxi from Banjar for visiting Jalori Pass. Bhuntar Airport near Kullu / Manali is the nearest Airport to Jalori Pass. The next and bigger Airport is located in Chandigarh city. You can catch a flight to Bhuntar and then travel from there to Tirthan Valley by either taxi or public transport. If you were in Manali and wanted to visit Jalori Pass, then you have 2 ways to do so. The best way would be to hire a private taxi for the entire day which will definitely cost you over Rs. 10,000. This taxi can bring you to Jalori Top, show you around and then return to Manali by evening. Or another way would be to catch a Bus from Manali for Banjar and stay in Tirthan Valley for the night. Next day, you can then visit Jalori Pass from Banjar by Bus and return by evening. During winter season, Jalori Pass remains closed and cannot be visited. Due to its high altitude, the weather at Jalori Pass is always very cold. The wind speed at this altitude is always high and you will start to feel the chill within a minute of stepping out of your vehicle. But as you start to descend towards either Shoja or Anni, it will start to feel more of a pleasant cold rather than the unbearable type. Weather in this region remains pleasant between April till June and then in the months of September and October. November till March are the months of extreme cold when the entire valley remains buried under a light sheet of snow. Monsoon arrives in July and lasts throughout August. It rains around here quite a lot and sometimes enough to trigger landslides. The road at Jalori Pass is a badly broken dirt trail which turns into a slushy nightmare after it starts to rain. Not just Jalori Pass, but the best time to visit any place really depends on your reason to visit; and a few other factors like how you were traveling and if there were any budget constraints. 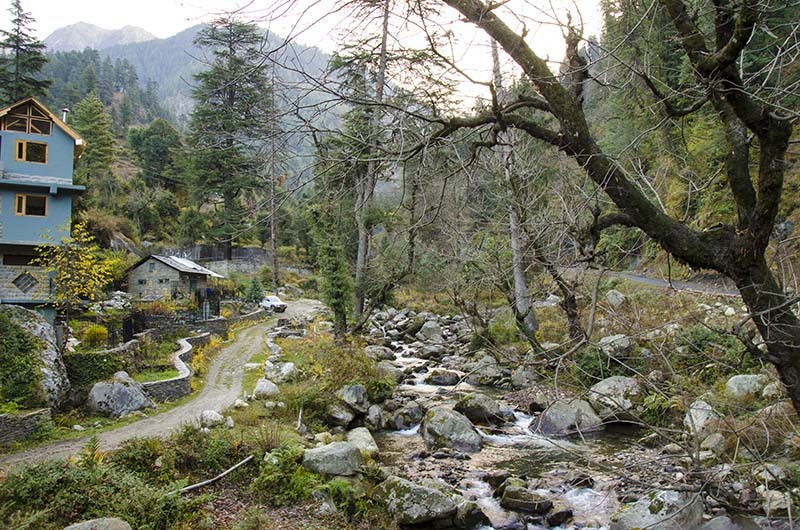 A trip to Jalori is usually combined with Tirthan Valley so your overall itinerary too plays a role to some extent. With that being said, the months of April, May, June, September, and October are usually considered the best time to visit both Jalori Pass and Tirthan Valley. But will these months suit you as well? Read on to find out. Let me break it down month by month to explain when you should plan a visit to Jalori. Jalori Pass in January: You cannot cross Jalori Pass in January; but you can travel to Tirthan Valley from Mandi side and enjoy some snow there. Jalori Pass in February: Same as January. In both these months, you can only drive till Anni from Shimla side; and Ghiyagi from Banjar side (or Shoja if snow was less). 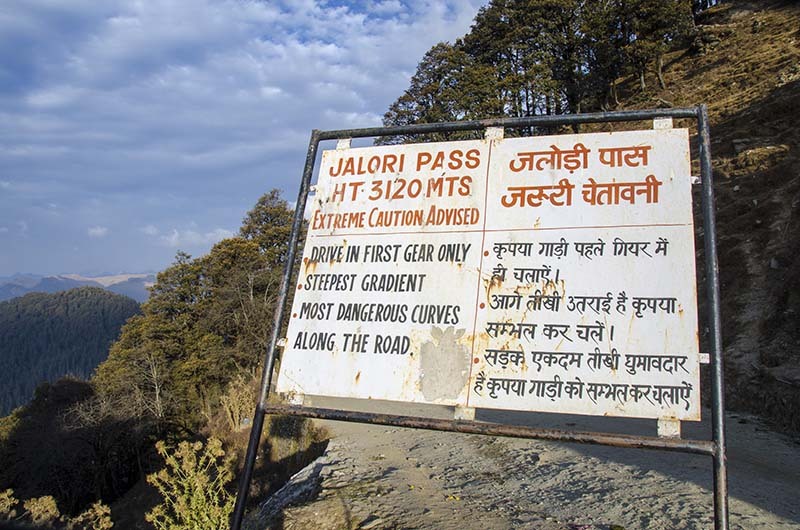 Jalori Pass in March: Same as Jan & Feb; though you may be able to visit Jalori Pass towards March-end if it was declared open. Jalori Pass in April: Great time to visit. Jalori Pass will be open; and weather will be pleasantly cold. Jalori Pass in May: Another good time to visit with slightly warmer days and roads all open. Jalori Pass in June: Same situation as of May with even warmer temperatures. It is a great month for trekking and camping trip. Jalori Pass in July: Not a good time to visit with Monsoon in full swing. A lot of slush on the road making it tough to cross. It can rain anytime anywhere. Jalori Pass in August: Worst month to plan a trip because of the monsoon season. Landslides in this area are common. Scenery and vistas at this time, however, will be at their best. Jalori Pass in September: Best month to visit in my opinion. Monsoon will be gone but it will still be lush green valleys all around. September has all that monsoon can offer but without the risk of the rain. Jalori Pass in October: Again a good month to visit but with very cold weather. It is a great time if you want to see the golden orange in the trees that the autumn season brings. Jalori Pass in November: Bad month to visit. Weather will be very cold, the scenery will be dry and dull; and there won’t even be any snow around. Jalori Pass in December: Jalori Pass gets closed in December and cannot be visited. I have covered this topic in details in another article, When is the Best time to Visit Tirthan Valley.I know the title says Tirthan Valley but it will be applicable for Jalori Pass as well. What clothes to bring will depend on your time of travel. For a trip between November to March towards Tirthan Valley, you will have to pack all heavy woolens and a windproof jacket. A pair of boots capable of handling snow would also be required if traveling in either January or February. From April to June, your regular cottons, some light woolens, and a windproof jacket will do. For visiting in July and August, you will have to pack clothes that can dry faster, like Polyester. A waterproof jacket will be a must for visiting in either of these two months. For a trip in September and October, regular cottons along with light woolens and a windproof jacket will be enough. If traveling towards the end of October, you may want to pack some heavy woolens as the weather here gets very cold as October progresses. Jalori Pass is actually a tourist attraction in itself and in fact, is at the top of the list of places of visit in Tirthan Valley. So the question really is of some other places to visit around Jalori Pass. Seruvalsar Lake (Sirolsar lake), Budhi Nagin Temple, and Raghupur Fort are three places located within a short distance. The trek to all these three actually starts from the top of the pass itself. There is also a camping site at Sirolsar Lake if you wanted to stay there for the night. Apart from the above three, below is a list of some other tourist places near Jalori Pass. All of the places listed below are located in Tirthan Valley. How many can you visit will entirely depend on the time you have in hand. To know where these places exactly are and how can you plan a trip here, please read Please to visit in Tirthan Valley & Things to Do. Trekking and camping are the two activities that you can enjoy at Jalori Pass. Catching a view of the Sunset and photography can be the other two that you will have plenty of time to enjoy. But that is not just it. There are several other fun things to do in Tirthan Valley that I will list down below. For more details on these activities and to know where can you enjoy them, please read Places to visit in Tirthan Valley & Things to Do. Sirolsar Lake near Jalori Top has a camp site that you can stay at. Apart from this, all other towns in Tirthan Valley have several hotels and guest houses good enough for a stay. Mentioned below is a list. Jibhi: Known for its Victorian style wooden cottages that a lot of tourists look forward to staying at. Ghiyagi: There are several hotels and guest houses located here but Shringi Vatika is probably the most commonly known one. Gushaini: There are a lot of stay options available in Gushaini of which, Raju Bharti’s cottage is the most famous one. Majority of the people visiting the valley arrive here to stay. Banjar: Banjar is the largest town of the valleys of Banjar and Tirthan. There are several hotels and guest houses here. Sai Ropa: There is a Forest Rest House here that you can stay at but you will have to get the advance booking done. Shoja: There are a few stay options available here of which Banjara Retreat is the most famous one. Nagini: This is another village in the valley where a lot of tourists stay. Khem Bharti Guest House (also known as Trout Valley guest house) is a good guest house available in Nagini. If you want to pitch your own tent, then do not do it at Jalori Top itself. It will get very cold at night with fierce winds. Instead, go to Sirolsar Lake and pitch your tent there after paying the local camp site owner a small fee. Another place where you can go self camping is at Raghupur Fort. In Tirthan Valley, there are several spots along the Tirthan River where you can camp. Only BSNL may have some connectivity while you are standing at the top of Jalori Pass; but even that is highly doubtful. I did not see any reception for either Airtel or Vodafone there. However, once you start to descend towards either Shoja or Anni, you will be back on the network after a short while. All networks work fine in Tirthan Valley for both prepaid and post-paid connections. I have seen Airtel, Vodafone, Idea, and Jio getting used without any network problem. If you were, however, planning to trek to the remote villages, then only BSNL will work. If you went deep into the forest in the national park, then even BSNL will not work. But as long as you are staying in towns like Gushaini and Banjar, you will have a good connection with clear voice. In terms of Data connectivity, you will get 4G Speed if it is activated on your phone. The condition of the road about 5 kilometers on both side of Jalori Pass is bad; and when I say bad, I mean really bad. There is no Tar anywhere and it is a dirt road all the way. On top of that, it is also bad and broken. If it rained, the entire stretch will turn into a nightmare for sure with all the slush. To make things worse, the climb is also very steep. The road, however, is good for rest of the way while traveling towards Jalori from either Shimla or Mandi. It is only around Jalori top that the condition worsens. It will entirely depend on your driving skills actually. Why do I say that? Because I have seen locals drive around in a Maruti Alto without any difficulty. A friend of mine did the trip in his i20. Just make sure that your vehicle is in good condition and the person at the wheel knows how to maneuver a car on steep climbs and sharp turns. If you can get an SUV, it would be the best vehicle but may give a little trouble on narrow roads. In terms of a motorcycle, I was riding a Royal Enfield with 2 people on it and the entire luggage. For the last few kilometers of the climb, I continued to switch between 1st and 2nd gear; but it was only when we got close to the top. So if you were on a smaller engine bike, I would recommend riding light and solo. It snows at Jalori from late December to February but not too much. If visiting in January, you can drive as far as Ghiyagi or Shoja and then start walking towards the pass. Go as far as you can and you will definitely find snow on the road. Petrol stations too will remain available at several places on the route. Just get a tankful done at Mandi (or at Narkanda or Anni if coming from Shimla side) and it will be sufficient to get you back after driving around in Tirthan. You will also be able to find mechanics at almost all towns in Tirthan Valley but only for minor fixes. For anything major, you will have to bring back your vehicle to Mandi. There are banks and ATMs in almost all the towns in Tirthan Valley. You will easily be able to withdraw cash in Banjar and Gushaini. Even while driving there via Aut, you will continue to come across Banks and ATMs at regular intervals. There are hospitals available in Mandi, Aut, Banjar and Gushaini as well. To be on a safer side though, carry some basic medicines like for flu, fever, stomach ache etc. A minimum of 4 days is what I will recommend for a trip to Jalori Pass; and I am quoting this number for someone starting from Delhi or another place at an equal distance. You can do with a lesser number of days as well depending on where you were coming from but 4 days is an ideal time if you do want to enjoy the trip to its fullest without rushing in any part of the journey. If you can afford more time than it will allow you to visit more places in Tirthan Valley. To end the article, I will suggest an example of an itinerary that you can follow for a trip to Jalori Pass. For the sake of this itinerary, I will assume that you were coming from Delhi. If you were, however, coming from a different city, then only the journey on 1st and last day will be different. Rest of the details will still apply. A different approach to the trip can be like this. If you were traveling by public transport, you can plan your trip in the following manner. The drive to Jalori Pass from either side is quite steep and on a bad road, so please be prepared for it. Bashleo Pass is another great trek that you can embark upon. But it is usually done in 2 to 3 days with one night spent camping. If you are up for some challenge and have the time, the trek is definitely worth giving a shot. The Bus stand in Banjar has great connectivity with the rest of the valley and other places in Himachal Pradesh. There are regular buses, every 30 minutes, for other places in the valley with Batahad being the last stop. Buses toward Jibhi, Shoja and across Jalori pass are a bit less in frequency. Shared taxis travel towards Jalori Pass and across to Anni Village. There is a taxi stand in Banjar from where you can rent a private cab as well. That I think covers all that you need to know about visiting Jalori Pass. I hope the information above was of help. If you have any questions; or need any other details; please feel free to ask in the comments section below; or at our Community Forum; and I will be glad to answer. If you have been to Jalori Pass and have a few other tips to share that can be of help to to others, please do suggest.